Quakers Close was built in 1968 on land belonging to "The Pales". 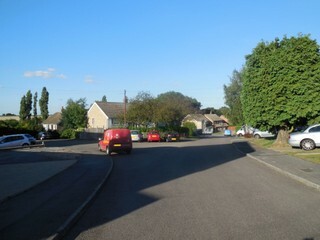 The 28 properties are a mixture of houses and bungalows. 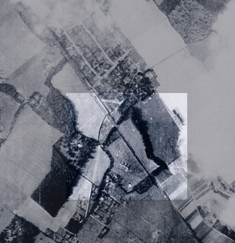 Quakers Close, like Copse Side and Hottsfield, was once part of a field called Hottsfield. For centuries this field had gone with New House Farm in Church Road, which was owned in the 1920s by George Day, who lived at North Ash Manor House (now Bovis's headquarters). In 1924 he sold Miss Edith Capper 4 acres of land, on which she built the house called "The Pales". She was a devout member of the Society of Friends (Quakers), which is the origin of the road's name. Edith Capper was born in 1877 and lived to be 101. (2) The Pales in 1940. Taken by a German reconaissance plane. 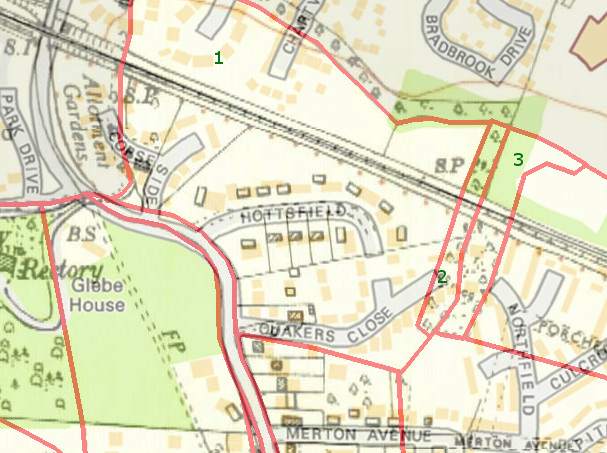 I have highlighted Hottsfield in the centre. It stands out as it is surrounded by woodland and bisected by the railway. 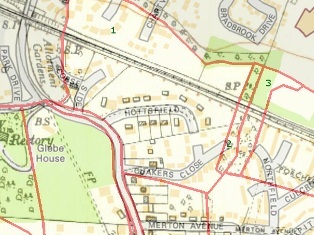 The Pales is at the southern end, just under the 3 houses of Hottsfield. In the 1960s most of the land was sold B W Brazier (Anerley) Limited, who got planning permision in 1964 to build the road. However The Pales still remains (with a very much smaller garden). The houses were completed in the period 1967-70. The houses are named, but it seems the developer expected street numbering. In 1967 one of the houses would have set you back £5,895. The last two houses in the close - Chestnuts and Wickets End have a different history, as they were part of the Payne and Trapps estate (plots 241 and 242 on the former Porchester Crescent) and were built later than the other houses. Originally the council did not want vehicular access onto Hoselands Hill and this is reflected in a 1967 deed with the developers, but after a site meeting in 1969 the County Council decided to suspend this decision indefinitely. However it was eventually agreed (1979) that the developer could build on the land reserved for the proposed Wellfield access, so long as they did not apply for permission to build across the Ash Road entrance. Sevenoaks Council transferred the land to Braziers in 1979 and the houses Wickets End and Chestnuts built in the following year. 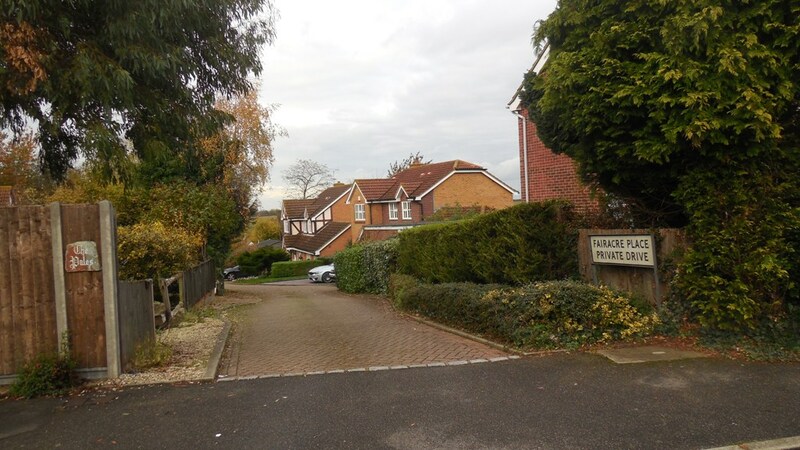 Fairacre Place, a small side road of 3 detached houses, along with Timothy House and Charlotte House on Hoselands Hill, were all built in 1993 on the site of a bungalow called Fairacre. Miss Capper sold the land for it in 1945, and the house was built in 1954. 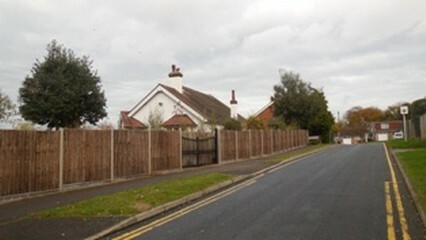 The road is a private street and not adopted by the council. (2) Planning Permission: 2014/3984 Erection of single storey side and rear extension to form lounge, bedroom and en-suite shower room/w.c. Alterations to fenestration. (1) Plot History: 1923-1968 Part of "The Pales"
(2) Planning Permission: 2014/3818 single storey rear extension. (2) Planning Permission: 2016/2674 Erection of single storey side extension and partial loft conversion with the creation of a dormer and changes to fenestration.